Back in June, I was busy studying for a big exam and had almost no free time to sew or really do anything enjoyable. After a couple of weeks, I started going a little stir crazy and decided that I would let myself work on a baby quilt for a friend. I spent an afternoon picking a fairly straightforward pattern and laying out a couple of charm packs and some scraps from my "light neutral" drawer. 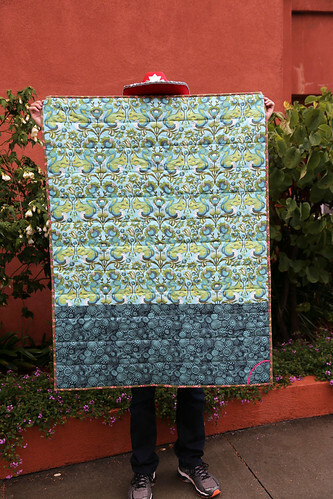 From then on, I let myself make one block per day until I had a finished quilt top. Trying to avoid adding yet another WIP to the pile, I whipped up the world's simplest backing from stash and basted it in early September. 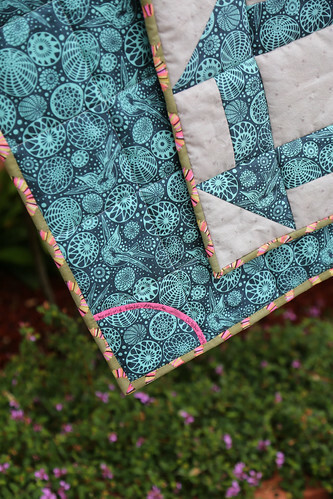 I spent a few weeks trying to figure out howto quilt it before finally opting to stick with boring old Stitch-in-the-Ditch. Although it's not too exciting I think the quilting actually highlights the blocks quite nicely. The quilting and scrappy low volume background prints minimize the secondary square-diamond-square pattern between the the blocks that I was trying to avoid. The Dream Wool batting I used gave this quilt just the right amount of puff. I used a remnant strip of pink voile to make a bias tape label and bound it with another print of Acacia yardage that I was hording. I think my favourite part of this quilt is the fact that the squirrel print on the back is perfectly centered and symmetrical on the back of the quilt. Definitely not planned but a welcome surprise after I trimmed up the quilt top. Fabric: Two Tula Pink Acacia charm packs and various low volume scraps. Pattern: Baby Love by Camille Roskelley in her book Simply Retro (with an extra row of blocks since I'm not a fan of square quilts). 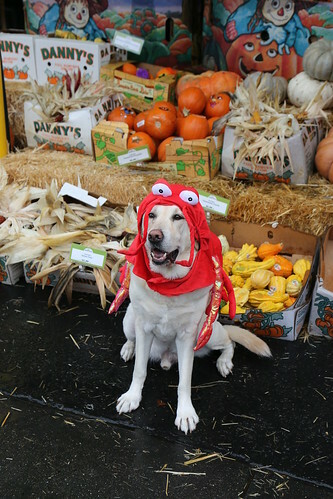 Our lobster-dog wishes you a safe and happy Halloween! Adorable quilt. Love the backing fabric as well. 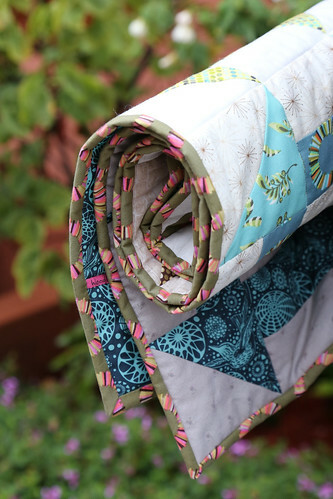 SID suited this quilt well as the quilting does not take away from the fabrics in the quilt. I like it! And I know all about not having much time but itching to be creative any ways. It worked out very well for you! I really like the scrappy look of this! Nicely done. Cute lobster dog - what a good sport :-) Your way of making a label is unique to me - I might just have to try that. 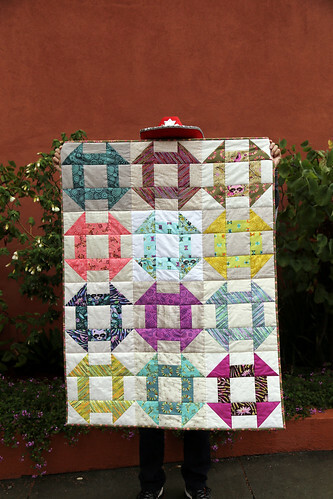 lovely quilt, too! !